Three days on, I’ve settled on a conclusion for the 42-7 Rams hammering. It was a nightmarish day, uncharacteristic of this team under Pete Carroll. It does hint towards some changes that need to happen. It’s also a sign that they can’t rely on some of their ageing stars anymore. I also thinks it’s worth making a few points. This was a perfect storm for the Rams. They were healthy and hungry, the Seahawks banged up across the board and missing a colossal number of players. Seattle contrived to do everything wrong on all three sides of the ball. Two weeks ago the Seahawks handled the NFC leading Philadelphia Eagles. A few weeks ago a much healthier and in-tune Seahawks team beat the Rams in LA. They forced five turnovers and could’ve (should’ve) won more handsomely than they did. When the two teams meet next year at Century Link — even while acknowledging the Rams are a greatly improved team — it will be a contest. That’s assuming the Seahawks don’t give LA fantastic starting field position for every possession, lose multiple key starters and lay an egg on all three sides of the ball again. It was a highly embarrassing loss. Yet not quite as cataclysmic, in my opinion, as we thought during and immediately after the game. Here is what I believe the Seahawks need to do to get back on track in 2018 — because the playoffs are now highly unlikely this season. Tough defense and a big-time running game. It’s not as difficult as it sounds. They have talent on the D-line, at linebacker and in the secondary. They need more talent to aid the running game. They will have some cap room. Not tons, but some. They probably won’t get back to their best immediately. It might take two off-seasons. But it’s achievable. Who do you need moving forward? Who best helps you achieve your desired identity? Sheldon Richardson might be costly but he’s also most likely to help you achieve a tough, physical defense that defends the run very well. We’ll see how they feel about Luke Joeckel but they might think consistency up front is worth more than a further change. Either way — identify who best helps achieve this strict identity and don’t think twice about releasing the players who don’t fit. Bradley McDougald was a good move. In the past they’ve used the veteran market to their advantage. The Chris Clemons trade. The value additions of Michael Bennett and Cliff Avril. They didn’t hit a home run in free agency a year ago but they’ve done it in the past. They’re capable. We know that. If possible, add a blocking tight end and make the moves that will help establish the running game. For me, looking at this class, a solid plan would be to draft either the best defensive player in round one or the best running back. Adding a defender who can be part of the next core would be a huge boost for the future and help the defense reload in 2018. There is enough defensive talent in this draft (see below) to feel good about that opportunity. Failing that, add one of the really good running backs to inject talent at that position and finally get someone you trust and want to feature at RB. It’s unfortunate they don’t have their second round pick to be able to aggressively target these two areas. Maybe they can get some picks back? Kam Chancellor, Richard Sherman, K.J Wright. Core players added between rounds 4-7. They’ve had a stretch now without a major defensive hit in that range. Time to put that right. Again, we know they can do it. In the past they’ve used former GM’s to enhance the front office. That’s not to suggest John Schneider is incapable. Some of the criticism levelled at Schneider is silly. But they’ve had Scot McCloughan and Jeff Ireland on board in the past. Is there someone of that ilk they can bring in to get all hands on deck for this important draft? And are there a couple of established coaches out there willing to come in and add to the staff? I don’t believe firing coordinators is necessarily the answer. I think adding even more knowledge, experience and quality could be. I’d also look at the college ranks to see if there’s anyone to poach. For example — Washington State defensive coordinator Alex Grinch (sorry Coug fans). Sell him the idea of being the next Dan Quinn and make it worth his while in terms of salary. Dan Quinn went from Seattle’s D-line coach to Florida’s defensive coordinator, then in charge of Seattle’s defense before becoming the Head Coach in Atlanta. Add coaching talent. None of this is reinventing the wheel. It’s not as outrageous as the ‘trade Russell Wilson’ takes (sigh) or suggesting a whole new staff is required. It’s a recommitment to what made this team work in the past. Note — I didn’t include Sam Darnold. There’s enough talk about him staying at USC to believe that is likely. With accuracy, a great release, the ability to make a range of throws and ideal size — Rosen has every chance to become a very good NFL quarterback. Yes they need to think about the future at quarterback. But how do you turn down the prospect of Barkley, Odell Beckham Jr and Evan Engram on the same offense for the next however many years? Bradley is Nick Chubb’s cousin. Nick had one of the best SPARQ workouts imaginable in 2013 at the Nike combine. Bradley is a 6-4, 275lbs version of Nick. Fantastic player. Ferrell can play inside or out and would be a nice compliment for Myles Garrett. The Browns can learn a thing or two from the Jaguars and their fearsome D-line. The Cardinals, needing a long term answer at quarterback, trade up to make sure they get their guy. Baker Mayfield belongs in the top five. With the top two quarterbacks off the board the Jets, who reportedly like Allen (per Tony Pauline) make their move and find a willing trade partner in Chicago. The Buccs could go in a number of directions but Vea is a rare talent and would work perfectly next to Gerald McCoy. Vea could be the next Haloti Ngata. Probably the second best player in the draft behind Saquon Barkley. He lasts a little longer due to the rush on quarterbacks. This would be great value and fill a big need. Very reliable defender with the versatility to be a modern day defensive back. Fitzpatrick will go in the top 10 or 15 picks — whether he goes earlier than this will depend on his workout. Ridley is adept at getting open and he’s consistent. He isn’t big but the Bears might settle for a reliable go-to target for Mitchell Trubisky. The Niners have their quarterback it seems — now it’s time to make his life easier with some weapons. Sutton can do it all, has great character and looks like an early pick. Wow — what a talent. He can play inside or outside linebacker, drop down and play the edge. He is going to go early — and Tony Pauline thinks he’ll run in the 4.5’s and jump a 40 inch vertical. Tough, physical, great closing speed. Brilliant. Might be a bit small for some teams but he absolutely flies around the field and he’s been the standout player on Georgia’s SEC Championship defense. We’ve talked a lot about Price and Quenton Nelson. There’s not much between the two. They are exceptional prospects. Urban Meyes loves Price and he coached the Pouncey’s. Huge tackle with NFL bloodlines. Likely a right tackle but that would suit the Chargers. He can bookend Russell Okung. Considered by many to be the best of a bad bunch at tackle in 2018. At times he looks like Warren Sapp. Huge size but moves so well. A rare player with the size to defend the run and the quickness to be a pass rusher. Had a really good performance against Harold Landry of Boston College. Worked well with Quenton Nelson. Would make a nice right tackle in Baltimore, working across from former Notre Dame team mate Ronnie Stanley. The Lions could’ve had Ndamukong Suh and Aaron Donald playing next to each other. Instead they drafted Eric Ebron and fudged Suh’s contract. They need an interior playmaker. Drew Brees is out of contract and while he probably stays in New Orleans, the Saints need to think about the future. They move above Buffalo here to get rising prospect Drew Lock. More Eric Reid than Eric Berry and that’s why he might last. Looks the part and is physical but lacks the great range and athleticism to go earlier. Edwards’ combine will severely impact his stock but he’s shone for Wisconsin and could easily sneak into the back end of round one. Underrated, complete running back who is a much better athlete and playmaker than people realise. Great in pass-pro, electric at the second level and tough. He will be good. Might not declare though. Big Taven Bryan fan here. Not the finished product but the Gators struggled so much it was never going to happen in 2017. Expect a great combine performance. He will move up boards. The Seahawks trade down with the Saints to get back some of their draft stock and take a player who looks so much like Jamaal Charles and can rejuvenate their running game. Had a really strong season in a middling Michigan defense. The Bills could do with re-stocking their defensive line after dealing Marcell Dareus. Off field mystery and a couple of injuries will lead to some concern about Key and he could drop out of round one. That said — he is very talented and a good team could take a chance on his talent paying off. One of a number of star performers for Clemson this year. Is probably helped by the loaded interior D-line he plays next to but Bryant has had a really strong 2017 season with 14.5 TFL’s. Physical, tone-setting safety who hits with a bang. His tackle injured Kerryon Johnson and changed the face of the SEC Championship game. This is not a good draft for cornerbacks — a complete reverse of a year ago. Denzel Ward has shown enough to think he might be the best and it’s likely one of the CB’s will go in the first round. A playmaker with great toughness, capable of making grabs downfield, exploiting screens and breaking tackles. Shifty. Combine will determine how early he goes. I watched him after Tremaine Edmunds and intend to watch more. Evans has the potential to go in the first round but his combine will be important. I prefer Kerryon Johnson but there’s two reasons why I went with Love here. Firstly, no injuries. Secondly, he looks like a Philly back and would compliment Jay Ajayi. May suffer due to the injuries he’s had but would provide value in round two along with the other running backs still available (eg Royce Freeman). Tony Pauline has reported some potential injury red flags and others suggest he’ll run in the 4.6’s. He’s a really good player but he might not go as early as I originally thought. There’s increasing buzz that Williams isn’t as highly regarded by teams as he is in the media. There’s always a demand for offensive tackles, however. In the plan earlier in the piece, we discussed targeting the best defensive player available or the best running back. In this mock scenario (it’s still very early) a lot of the top defensive talent is off the board at Seattle’s pick (#19). Tremaine Edmunds is gone for example. There were alternatives but the likelihood of a trade down is relatively high considering Seattle doesn’t own a second or third round pick. They deal with the Saints who might be looking to target a quarterback of the future to develop. Using this updated trade chart, the Seahawks could net a third rounder. The thing that makes the trade unlikely is the Saints are already without their second round pick (dealt to get Alvin Kamara in the 2017 draft). However, they might be more inclined to be aggressive given their successful season so far. With the #24 pick they take Ronald Jones II, who we talked about in more detail here. He isn’t like a lot of the running backs they’ve drafted previously but he’s immensely talented and looks a lot like Jamaal Charles. The Seahawks probably need someone they crave to feature at running back. It kept them on track in the Marshawn Lynch days. Jones II is the type of player you can’t keep out of the game. There’s a lot of debate about whether it’s the running backs or the O-line preventing Seattle from running the ball. It’s probably a bit of both — but here’s the reality of the situation. Chris Carson averaged 4.2 yards per carry before his injury. Mike Davis averages 3.9 (he was above 4.0 before the Rams game). J.D. McKissic is on 4.2 YPC. Thomas Rawls and Eddie Lacy are both at 2.6 YPC. If it was true that Seattle’s offensive line was completely inept at run blocking we wouldn’t be seeing Carson, Davis and McKissic recording a similar YPC to the names listed above. Talent at running back is an issue. When Carson got hurt they simply couldn’t rely on Rawls and Lacy and thus didn’t feel like they could properly commit to the run. They’ve been able to do that more with Davis. If they have talent at running back — it stands to reason they will feel confident featuring the running game as much as they desire. Carson could still be the guy for the long term. Adding another RB, especially with the talent in this draft, would provide insurance and truly help the Seahawks’ attempt to regain their preferred identity. Going back to the mock, they could trade down again and still get a good back. That’s the beauty of this class. They can move around and still address certain issues. There are some good offensive linemen slated to go in rounds two and three (Braden Smith, Will Hernandez, Frank Ragnow, Isaiah Wynn, Coleman Shelton). If they drop into round two the likes of Damien Harris, Ronald Jones II, Kerryon Johnson and Royce Freeman could be available. There will be defensive options. They might be able to gather a nice haul and address their needs. So it’s not all doom and gloom. Man it would be so nice to get a good quality defensive player first then a RB second due to the depth at RB. It would be nice having Jones ad well. I just wonder what the Seahawks think they have in Carson? If they think he is long term or just the guy for this year. If they think he is the long term solution then RB might be out of the running early on. As much as I love the season itself I can’t wait for the off-season to start. I am with you Greg. I really hope they get an impact defender 1st and then RB. If Price is still there he would have to be a consideration as well. Too bad we don’t have the Browns picks 🙂 Nelson and Barkley would fix run game instantly! Rob, what’s your take on trading away players to recoup picks and salary cap? As you said, players part of our core can’t be counted on as they used to. As I am not Rob that is a good question Preston. Kam, Earl, Sherman, Bennett. It looks bleak. Not sure I want to trade Earl, Bennett might be to old to trade, Kam maybe but he has a high salary and is somewhat broken. I guess Sherman might get you the most (maybe a 3rd) but he has a high salary as well coming off an Achilles. Whats your thoughts Preston? If the price is right, I think anyone should be up for sale. Obviously we won’t trade Sherman for a 7th. But I think getting a 2nd or a mid to early 1st is feasible for Earl Thomas. Reason I bring him up the most is he’ll be most wanted by teams besides Russ. You solve several problems by trading him away. The patriots have done it with success. Just don’t think the trade off of keeping him outweighs the benefits. How good is going to be in a year, or two? How often will he miss time due to age and injury? But if we trade Earl, we’ll need to change our entire defensive scheme right? Bobby is a GREAT player but to me, Earl’s the most important piece of the defense because if he’s not back there in centerfield stopping the long passes/covering up for any mistakes by a CB, the defense as we’ve known it won’t be the same or as effective. Unless Earl wants out, I would never trade Earl and instead, would want to add better defensive players around to make our defense even better. In regards to trading away players when does New England do this? Is it before the players have been paid on 2nd contracts? The guys we are discussing are in their 3rd contracts and are aging. A lot of the NE guys were young when they got good picks back. Earl is only 28 and is a future hall of famer. Unless they are going to do a full re-build, he’s not going anywhere. KJ and Bennet are the 2 I’d be fine with trading. With Sherman, if you can get higher than a 3rd, which will be tough with him coming off the injury. Kam will be hard to trade or cut due to his salary. I’m going to keep bringing this up in regards to earl Thomas. he’s a free agent after 2018. so with the analog to Sheldon Richardson you’re looking at best a second rounder but i would be surprised if he garnered more than a 3rd rounder for a year rental. then seattle would need to find a centerfielder in the draft. Really appreciate your words of reason, Rob. Love the idea of dropping back to get a day two pick and still grabbing a special player like Jones II at a position of need. I’ve been strongly in favor of signing Sheldon all along, but lately found myself having some doubts. With the Silver piece along Carroll saying the other day on Brock and Salk that they weren’t going to find value where they would be picking in R2 this year that would come close to Sheldon, I’m starting to reverse my thoughts. If Silver is right, and a purge of older vets is coming that includes Michael Bennett, doesn’t that make relatively young Sheldon Richardson all the more important to hang on, even at say, close to $14 mill? Or is it better to keep the cagey older vet Bennett for another year, on cheaper $ to see if he can inspire some wisdom and professionalism on Malik McDowell while probably transitioning the 5tech spot to him? Naz Jones to me seems like a starter in this league, and someone who could end up being a pretty good one, and that sort of mitigates feeling the absolute need to drop big time $ on Sheldon. As bad as Joekel was against Donald, he wasn’t the only Seattle OL who was bad against him on Sunday, and I feel less confident at what is on the roster behind him than I do with what is behind Sheldon. I’ve been ripped a bit on this board for suggesting this, but without Day 2 picks, and the need at RB and youth on defense, wouldn’t it be smart to keep Joekel and build cohesion on the OL instead of rolling out with unprovens in Roos, Odhiambo, or rookie player? Brian Baldinger was calling Rams LG Rodger Staffold the best LG in the game yesterday. Before this season, wasn’t Staffold widely regarded as a stiff and a JAG? Appreciate your thoughts and the work you do. It seems that Richardson will go.back to Jets. So at the end we gave no50 from.2018 for no100 from 2019 draft. For what? For one year without play off. Are you just speculating Sheldon back to the Jets or is this insider knowledge? NY daily news sports wrote about that today. Note that the author of that piece has a reputation among Jets fans for pushing baseless speculation as news. The Rams O line was horrendous last year, but looks incredible this year. By no coincidence, their new O line coach is Aaron Kromar, the same coach who delivered Pro Bowler after Pro Bowler as the Saints O line coach. Coaching matters, a lot. He’s also the same guy who threatened to kill someone’s entire family in Buffalo and was thus suspended by the team. Piece of garbage person but he is an amazing coach. +1 he and Bill Callahan are widely regarded as the best in the business and the results show. The Rams also added a quality Vet LT in Whitworth and a vet C then gave them a full off season to gel. Another question, if Avril and Bennett were both gone next year, who is the leader of that D Line? Clark? Clark, probably. Sheldon maybe if he is kept, but is he a leader type?. Naz Jones has a bit of a Red Bryant strong personality, I think, that if thrust into a leadership role, he would take to it. I really think Bennett is back next year. 1. Agreed, but for, that would only be McDougald. As much as Richardson would be great, probably too expensive. 5. Would look to at least make 1 coordinator change as well as lose Cable. You can’t have a season like this and not make an OC or DC change. Yes, getting McCloughlan back would be great. I’m starting to wish the NFL would ban coordinators. Haven’t you heard? Dropping second in commands fixes everything. You mean fans of the prem league don’t call for their assistant coaches head when results dont come off? It’s the one big difference over here. Everyone hates the head coach/manager. In the NFL, everyone hates the coordinators! My reason for wanting Cable gone is that the Patriots fired there O-line coordinator after losing to the Broncos the next year they one the Superbowl with a much improved O-Line. Not saying there Oline won the Superbowl but they found way to block on the fourth quarter, and the rest of the season. You cant fault s for wanting the same thing, whether we get it or not. So because one team fired this guy this one time and everything worked, it’s a good plan? Shall we look through the history of teams firing O-line coaches and there not being an instant cure-all? I’m not down on the Seahawks, lets just say I’m a little disappointed that they couldn’t sustain the team like the Patriots have done. I’ve watch them from the beginning trying to build a team that struggled to build a roster without free agency. I’ve watched them struggle thru the 90’s as they searched for that elusive QB to go with a great defense. This team is better than those teams of that time era. The question is does PC/JS want to stay and do what it takes to get back to the promise land. I don’t believe it would take that long but they may have to go back to what worked for them. I like drafting a Damien Harris because I just don’t see Seattle finding another Lynch for a 5th round draft pick and I believe this guy can do it all. I like this guy as much as I did TE Kelce who I mock to draft in the 2nd round to replace Zach Miller instead of Christine Michaels. We had some success giving Cable some 5th to 7th round draft pick to trade for practice squad guys from other teams for OL, maybe Tom would do better in coaching them up than a new guy out of college. I might be reaching here but it worked for us before and I think maybe couching a guy with 2 or 3 years under his belt might be a better fit for Cable. When it comes to TE I want them to be able to block and to catch passes because that what makes them special and dangerous. If your going to bring back Graham just make him a receiver but I will say this he really looks like he lost some speed after his injury and I wouldn’t be against letting him go. The last thing I’ll say is the big splashes into FA should not happen like Harvey or Graham, we really don’t have the picks to trade and its never really reap us any rewards. Keep it simply which seems to work for us. I don’t think the run is over we are still a playoff team and if ya make it to the playoffs anything can happen. I’m am happy I have seen my team play 3 Super Bowls and win 1 a lot of fans out there can’t say that. I am of the mind of drafting stud D early and waiting on the RB. I feel with a trade back we can get an above average option this year in the 3rd or 4th round. With Carson and Davis we have seen it work as Rob mentioned above. Fantastic post Rob, I really love the idea of some upstart DC or OC coming in and injecting some new blood. Alex Grinch is a fine choice, what he has done in Pullman is remarkable. Not sure he would take to a positional coach, even if he is the “coach in waiting”. I would be disappointed if we traded down and missed out on someone like Derwin James or Taven Bryan. This is looking like a year where they can add a true impact player in the 1st round. I wish Alex Grinch would join us, we could use Mata’afa and the speed D.
But not acknowledging that the Hawks are consistently out coached, now face two superior, offensive-minded coaches in the Division and need more than some coaching window dressing is a miss. We’re at 26 games in a row and counting where we’ve failed to score a TD on the opening drive. We consistently under perform in the red zone. And, yes, the ground game needs to improve. For perspective, the Jags at the height of their ineptitude last year had gone only 23 games without an opening drive TD. Look, Coach Pete’s philosophy and the collection of gritty overachievers has made the impossible possible. This has been a team that we’ll all remember for amazing comebacks and intimidation not approached by teams with better talent. And, they are also a team that consistently wins by 2 when then should have won by 20 and has won despite basically forgoing the first half offensively. We have good, but not great assistants coaches who are supported by their loyal to his philosophy to a fault head coach. The Seahawks are not consistently out coached. And if they are so lacking in creativity, why did they have the leagues #1 offense in 2015? I dont think you can say we were out coached. Pete and DB have consistently out coached teams despite first half struggles. I agree, its crazy we do that. But Out coach? No. Out schemed in the first half? Sure, nobody can really argue that. But it is kind of by design. You can hate that part, but cant really say we are out coached IMO. I also think we need to change the blocking scheme, where i believe our guys are perfectly suited. ZBS requires extremely athletic OL. Which we have. But it also takes a lot of cohesion and smarts to execute, not only by the oline but by the RB as well. The oline has gotten better, (Still need to improve a ton) but our Rbs just cant get it done. If you switch the a power/ man scheme these uber athletic olinemen will just absolutely wreck some fools on the dline. I am like a wish wash when it comes to cable. I cant blame the guy and then i blame him. This year and last our ineptitude has been baffling. He is taking more of a hit this year because of the rbs then i feel he deserves. he has the talent and the draft capital now and if the rbs did their job it would suddenly jump, imo, to a really good oline. Because of the lack of running game teams are just dropping back in coverage and hammering russ. You cant blame cable for that. If we are going to be talking about firing cable and bevell then we also need to look at the RB coach. Why are his guys all missing the holes and reads? (I know some of it is oline) but, they arent as bad as they seem. Quite arguable that Kris Richard is consistently outcoached on third down and critical down and distance situations by most OC’s with enough talent to exploit his tendencies. The third and long conversions are a problem — but they were before Richard became DC too. I remember travelling all the way to Seattle for the Dallas game in 2014. Dallas pretty much won the game off the back of a 3rd and 20 conversion in the fourth quarter. Because they played some of the worst teams in the NFL over the last stretch of games. And Thomas Rawls was a more than capable back which took the pressure off of Bevell. And in no capacity were we the best offense in the league, that was undoubtedly the Panthers who blew us out 31-0 before the half. The Seahawks weren’t first in rush yards, pass yards, scoring, TDs scored, or yards per carry, and the Hawks weren’t second or third in any of those categories. One year of best DVOA does not equate to a good coordinator. Showing complete and utter inneptitude before the half nearly every week, that is a better indicator of your coordinator quality, because when it takes until you’re down 31-0 or in the case of 2012 20-0, and into the second half for your team to be able to score points, its a sign that things aren’t working out offensively, that youre being outcoached early, and it doesn’t matter that Bevell figures it out enough in the second half to get us to 24 points and just shy of the win, he still got outcoached, he lost. I mean goodness what lost us the superbowl in 2014 wasn’t just the pick, it was that our offense couldn’t stay on the field. Well what about the Titans, Rams, and Jaguars? Don’t you think the defense is exhausted by the second half after watching the offense go 3 and out over and over? Thats undoubtedly been a factor in the Hawks inability to come back as of late. I’m sorry Richard Sherman said it, and then doubled down, i have a feeling that reflects a lot of the sentiment in the locker room. I don’t entirely agree with this sentiment, yes they struggle and look horrible at times, but other times they seem like an elite unit, I think a big factor in this is how long Russell is holding onto the ball. Russell is holding the ball for 3 seconds a play on average. Yes him being a scrambling QB factors into that but even Cam Newton is getting the ball out in 2.7 seconds. I’ve yet to see a solid argument for keeping Bevell or that he is deserving of a free pass, even in 2015 the Hawks averaged 17 points per game on offense in the first half of the season (they had a weird number of defensive scores early). Bevell is at his best where a lot of OC’s are at their best, with a good QB, an elite running back, and a good enough O line, thats ok, but its been made clear since post 2014 that the Seahawks need someone capable of outcoaching the other team early. And don’t get me wrong, i liked the playcalling against Atlanta and Philly, but 2 weeks isn’t going to nullify consistent failure to score early which ultimately ends up costing us games. The Hawks were outcoached by Washington, they were outcoached by LA, McVay has Jared Goff at QB, we have Russell Wilson, yet they are miles ahead of us after only one season with a new OC. There’s a reason we saw this team get held to 5 points by a bad buccaneers team last season, theres a reason we saw a MEDIOCRE at best Rams defense hold us to 16, and 7 points. Its that Bevell isn’t an elite offensive mind, he’s the biggest JAG OC there is, good enough, but just barely. I mean seriously we act like this guy won us the Superbowl in 2013, like the defense was just an afterthought to one of the best offensive teams to ever win a superbowl. If Russell Wilson is going to be our superbowl window, we are gonna need someone other than Darrell Bevell drawing it up. Its like firing an OC is a taboo idea with seahawks fans. Usually just lurk around here, but thought I needed to interject an idea. While I’m not in the fire every coordinator camp, I have noticed that nearly every time the Hawks use power/man blocking, good things happen, but then they stubbornly go back to these reach/zone blocks that seem difficult to pull off against the beasts in our division and elsewhere. Anyone else notice this? So my concern, that if Cable is so stubborn in that system, than perhaps he does need to go. I’m willing to run with Richard and Bevell if the blocking system would get changed. I think it would make a huge difference. I think Pete is as tied to the ZBS as Cable to be honest. Because we could stay with a rather bland offense due to Lynchs” ability to gain yards after contact and move the chains. In 2015, the year where Seattle had the #1 offense in the NFL, Lynch was injured for nearly the whole season. Remember when teams who played us the previous week would lose the following week? We were so physical that the opponent had nothing left the following week. The Jags are the new Seahawks, and we simply had nothing left for the Rams after getting physically beat down for 4 quarters the previous week. 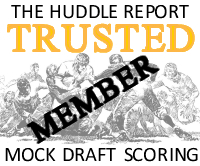 Another great write up Rob and well thought out Mock. Question is Rosen your top rated QB? Or are you putting him at #1 based on what you hear? Does his off field / character stuff concern you at all? I just have a hard time imagining a guy being a franchise QB when his college QB got fired because of the teams performance while he was the starting QB. I just don’t see any of the leadership traits you see with Mayfeild, Watson, Darnold who raise the level of play of those around them. I could be way off as I am no scouting guru but I see more Jay Cutler than Tom Brady. This team wont tank. Too much pride. However, there is legit chance they drop the last 2. Cowboys are heating up and Zeke is back. Then we play a Cardinals team that we needed our full defense for 3.5 quarters to slow down and still needed a miracle play by Russ to win. If we do end up 8-8 i think that really makes the decision interesting. That puts us at or around #14-15? JS would probably be able to add 2 pick in 2 trade backs and still pick around 24. However pick 14 puts you in Price, Mcglinchey, Settle, Edmunds territory. That is super tempting. I can see keeping Mcdougald. I want to let Jimmy go outside a sweeheart deal. What does he provide at 10 mil/yr that you cant get else where? If its just redzone threat of his size then what does he offer in terms of matchup that you cant get from a Josh Gordon or even a Mohammed Sanu? Plus they the benefit others provide between the 20’s. I think you have some great choices after round 1 for RB’s and identifying RB’s is a strength of the team. Adding coaching talent is the way to go. Grinch is a great one. Maybe Lake from UW or Aranda from LSU. Todd Orlando from Texas too. if that were to happen Id rather they stay at 14,15 and take someone like Edmunds and then trade players to recoup picks in later rounds. One team that seems to make a lot of sense as a trade partner for Earl is the Jags. They already have great young pieces and a domaint D. He could be the piece to put them over the top. If the Jags offered a 1st in 2018 and a 3rd in 2019 for Earl is that a deal you make if you are JS. I just think Earl is going to want a big payday in 2019 and for a small guy who relies on speed and physicality I would not want to sign a 29 year old Earl to a long term deal. I would much sooner have the picks and cap space. – midround 1st, early 2nd, 3rd from tradeback, 4th, (3)5th, (3)7th. That would be lots of draft capital to add young talent. A 1st and 3rd for Earl? Maybe 2 years ago. 3rd would next year. Perhaps not but I think for a team for the Jags he is worth a late round 1st at least. Trevor, are you living in one of them there states where recreational marijuana is legal? Canada and it is legal real soon. Why for trading Earl or expecting to get a 1st for him? don’t tell them that Trev, we might have to build a wall top keep them out! I’ve seen some suggestion for trading Earl because the feeling is that he wouldn’t be down for a mini rebuild and wouldn’t want to babysit younger talent. IMO, I don’t trade him unless there is a ridiculous offer on th table in terms of draft compensation, and I mean a ridiculous bounty. So next off season when a 29 yr old Earl wants top Safety $ what do you do? He relies on speed and violent hits. 30yr old NFL players slow down and breakdown. We A) trade him this off season B) Overpay another aging Safety next off season C) Let him sign elsewhere and get a 3 or 4th round comp in 2020. If JS can get a 1st round pick for him I make that trade in a blink. You could basically trade Earl for an LB like Edmunds in Rd#1 and $14 mil in cap space. Easy decision IMO. IMO, I don’t trade him unless it’s for a king’s ransom. He still the best FS in the game, and I don’t think he’s slowing down. At least, I don’t see it. I think there’s at least 3 or 4 years left of top end football out of him. Unless you just want to tear the whole thing down and start new, I would think that you want to hang onto some of your top end talent that you think have years left of solid play. Will I be shocked if they trade him? No, but I will be disappointed if they don’t get a handsome amount back. If it’s just a LB in the first round, then you got a gaping whole at FS which might be the most important position on this defense. I think the big issue with these fantasy armchair trade deals is that it puts too much value into a draft prospect. It’s easy to get hyped up reading these juicy details on potential picks and imagine the possibilities, but a draft pick is still just a gamble that you have to coach up. You can point to instant game changers like Marshon Lattimore and Zeke Elliott but those guys are the exception not the rule. There are just as many Johnny Manziels and Aaron Currys out there. Earl Thomas is a proven commodity and that to me makes him waaaaaaaaaaaay more valuable than just a first round gamble to me. To trade him to get a first round pick is like trading away a well-paying job that might be getting a pay cut soon for a lottery ticket just because the lotto ticket might earn you more if you win. Exactly, Earl is one of my favorite seahawks – Bwagz is another and unfortunately they are in a twitter fight? To trade earl, to where I could fathom it would have to be huge. People saying youre lucky to get a 1st for earl? If thats the case dont trade. If you are talking two firsts and seconds then i might take that gamble but id hate myself for it. I think a trade happens only if Earl kind of forces the issue, doesn’t want to be around for a bit of a rebuild, and wants to go to some contending team, and that team then offers decent value. Does anyone know the cap implications if Kam retires before 2018 then changes his mind and decides to come back in 2019? I wonder if he’d do something like this to help with our 2018 cap? If he retires we would save $2.3 million ($9.8 salary minus his $7.5 million in dead money). Then you would sign him a new contract for one year. Can’t imagine that happening though. Thanks Greg. Just wondering if there’s other creative ways this front office can create a little CAP next year. If you can cut both Jeremy Lane and Jon Ryan with post June 1st designations you can save $6.75 million in space. If you release/retire Cliff Avril there is another $7.5. That could open up $14.25 million. Recently watched a YouTube video of Richard Sherman saying he would like to play safety. Would he be a good fit? Strong safety maybe? I like the idea of bringing in Alex Grinch as the DC, and I have been saying for years (back when he was with Oregon) that Seattle should bring in Scott Frost as its OC. Both Frost and Grinch would give Seattle the spark it needs to make another deep run in the playoffs. World record for Christmasy staff? Frost and the Grinch singing Carrolls! Going into the Jax & LAR games I had a wait and see attitude concerning our team. I think the same is true for this game against Dallas. Losing close, or winning close doesn’t tell you much as far as how to handle the future. However, if they get smoked again (I can see them losing by double digits) then that pretty much solidifies the notion that something semi-drastic has to happen. As far as trades go; the likes of KJ, Sherm, Kam aren’t going to get you more than a conditional fourth at the best. I was thinking along the lines of how much McLaughlin meant for some of our drafts, but JS has done just fine. especially with ufa.I am hoping for new d coordinator fresh from collegiate level. that is what set seattle apart during PC first couple of years was his knowledge of whom he was recruiting etc. Thanks for saying this! The Hawks had a championship core that JS doubled down on (graham, Brown, Richardson). When Cam and Sherm etc got their contracts there was no way of knowing how injuries would play out. Maybe the locker room is eroding and it’s time to establish a new core but calling for Pete and Johns heads is asinine! Not since Holmgren have we had a team this good (don’t forget how good that offense was) and how many Super Bowls did he deliver us? Anyway, I love a stud defensive player. I think fixing the run game will be easier than restablishing the greatness of that defense and this blog has me pretty excited about rb potential in this draft. Need to find those guys who want to hit all day long. Keep up the good work Rob! Off topic…. but damn, UW is looking to have a really good recruiting class. We might have the #1 Ath signing too with the inhouse hire of Cristobal offering continuity. Devon Williams is 6’3 and plays DB and WR. Terrible off the LOS, but good vision, strength and length. I want to do a preview of the freshman class because some of these kids could be intense superstars. Patrick Surtain Jr. is a 5 star CB and son of former probowler Pat Surtain. He speaks like he’s 30. KJ Henry is incredibly humble and a protoype long DE. Amon-Ra St. James is the younger brother of 2 Notre Dame players and is probably the most talented of the three. He looks at times like the second coming of TO. The Pac 12 North race is going to be quite something in a couple of years.. I really like how Sam Taimani moves. I believe he projects to be a NT/DT. Colson Yankoff v.s. Jacob Sirmon v.s. Jake Haener will be an interesting QB battle. Best of luck to our teams! I’m pretty salty about Willie Taggart for you guys…. what a slimeball. I’d love to see Taimani stick at guard. I think he’s potentially one of the best in the country. Great work Rob! Do you, or anyone else, think Seattle could trade a 2019 compensatory pick, such as the one that Sheldon Richardson would generate if signed elsewhere, for a 2018 draft pick? Let’s say that Sheldon walks this offseason with a $14 mil/year contract, a deal that would most likely net Seattle a 2019 3rd round compensatory pick. Since teams can trade their comp picks, can you realistically imagine a team making that kind of trade with Seattle? Seattle trades its expected 2019 3rd round comp and 2018 4th round, for a teams 2018 mid-late 3rd round pick. We wouldn’t technically have the comp pick I dont think by draft time. I believe they get awarded after the 2018 league year which would be sometime in March of 2019. They can’t trade comp picks until they awarded. We can tag Richardson (14 milion) with non exclusive franchise tag. And if someone match that ofer we can get two 1st round picks. Thats a very interesting point. That would allow us a years grace to consider his value and re-up him when we have more cap space to work with. That also gives us no first year cap relief though when we dont have much. Could be an option but Im guessing they wouldnt do it. Here is a topic Id like some thoughts on. Our Oline, does it look like a hot piece of garbage because: it is? or does it look like garbage because of our Rbs. With thought two, what are we seeing every week? No run game to speak of. We cant get open quickly because teams are dropping more in coverage because they dont believe in our run game. This makes russ hold on to the ball longer and run for his life. Dlines are just teeing off with every pass rush move they have. They dont worry about gap control against us. Why do a lot of sacks happen on third down? Because teams know its a pass play and can just tee off, hence the draw play. So if our run game is going nowhere and its effecting our pass game, can we blame the oline? Everyone is on the fire cable train. But as Rob stated, carson is up there with ypc average. Shouldn’t all those people who are focusing on cable and bevell question our Rb coach? He hasnt been able to fix his backs and get them to see where the holes or cut back lanes are and exploit that. I think a lot of this hate should be directed toward(s)-(The s is for rob, his English is different then our English) him. You can see my post way above about how I want to switch schemes, but I really feel like the cable bevell hate train is misguided a bit. Plodding backs like Lacy and a timid, rusty Rawls. Just need a guy with the vision to see the holes and the burst to get through them. With ZBS, the blocking is supposed to secure you 3-4 yards every run if the RB reads it right, then the rest after that is up to the RB to improvise on the 2nd level the times he does get through. Rawls mostly isn’t reading it right and Lacy mostly isn’t explosive enough. The fact that a guy like McKissic is running well in our system gives me a lot more confidence to go out and grab a Ronald Jones II or Bryce Love. Both of these guys’ dedication is outstanding. Chicken or the egg. I would say both but I would go more 60-40 for the running backs. Just my opinion anyway. There was plenty of holes this season that when you watch the all 22 film the RB’s just flat out missed. There is other times when the d lineman is in the backfield and there isnt much he can do. Royce Freeman would be great for us. Just a classy pair of feet and eyes. Honestly he strikes me as a valuable backup at the next level. Freeman reminds me a lot style wise of ex Hawk Shaun Alexander. He is not a Beast Mode type back but you are right great vision and feet. He will likely be a real solid pro. If the Hawks take Price in RD #1 and Pocic bulks up this off season. The middle of our OL would be set for the next 5 years. Britt, Price and Pocic are all smart, tough interior lineman who can play multiple positions. With those 3 anchoring or OL for the years to come they could build great chemistry and become a strength of the team improving both the pass pro and run game. My vote is use the first pick on him if available the focus on RB and getting younger on D. I just think fixing the OL once and for all has to be priority#1 this off season. They are finally close I hope they finish the job! I think the O-line is virtually fixed. I really like Price, but the need for that level of investment in the interior O-line just isn’t there. I would be open to taking him but even still. I think Brown, Britt, and Pocic are all solid pieces. But who fills in at LG if we don’t resign Joeckel? And do you expect Ifedi to show continued improvement at RT, or would he be better suited sliding inside at guard for good? Hi SeaHusky — I think they’ll have options at LG. Could be a veteran. Could put Pocic at LG and bring in a RG. Jordan Roos has essentially got the redshirt treatment. Rees Odhiambo, in my opinion, looked good at LG in pre-season. And people have discussed George Fant moving inside. I think Ifedi has taken a step forward. I don’t know whether that will continue in 2018 but I’m optimistic. Question about Pocic needing to bulk up. What is the difference between lifting weights at the college level and the pros? He comes from LSU. You would think they would have a great strength/conditioning program. I wonder if Joeckel would take another one year deal? He is still young enough and he could really prove his worth. The more I think about it the more I like keeping the starting 5 we have. Get Pocic to bulk up, hope Ifedi takes off year 3 kind of like Britt did, let those 5 have an off-season to gel. Fant can be a swing tackle and Roos and Ohdiambo can be the back up guards and maybe draft a guy later. If Joeckel wanted hugs coin the no. Bring in a blocking TE that can really help that run game, bring back Luke Willson with Vannett and really attack the draft looking for you defensive players and a RB. Maybe LB or SS (Edmunds, Roquan Smith, Rashaad Evans, Ronnie Harrison, Derwin James). Its got me all fired up now…lol. Anyone knof of a great blocking TE coming off a rookie deal that doesnt need to catch many passes? And man my typing skills are as bad as the Seahawks run defense last week. Not sure how often frame and functional strength truly change after college. They do have gyms there but those kids also have to go to school. When your a pro thats your job. Usually pros make there biggest jump from year 1 to year 2. Hopefully he doesnt go the Ifedi route. Remember how much Fant put on last off-season? I think a professional conditioning program could beef up Pocic. Remember, in college, you’re not always competing against the best; in the pros, if you come with what worked in college, you’ll get worked. Fant came out of a he off-season ripped and added 30 lbs or so. If a guy has the frame to handle handle the bulk up, they can do it. I think it’s core strength that Pocic could stand to gain. Gilliam too. Point well taken. In the pros, you have access to Olympic-level steroids and other performance enhancing drugs. If you think Fant put on 30 pounds of muscle in less than a year natty, I have a bridge to nowhere to sell you. It’s also their full-time job to lift with world class trainers by their side. College kids only have so much time to spend in the gym. I think getting rid a Graham and putting in a good blocking TE as well as drafting a good blocking RB like D. Harris is the way to go. Could we roll with Willson (resigned), Vannett and the practice squad TE next year? I think Willson is a bit underrated, personally. If Seattle rolled out with him and Vannett, and they stayed healthy, I think they might be fine. Fixing the run game has to be the goal. C-Dog I agree. Willson is a good all round TE, needs to be resigned. Will Dissly from the UW is a great blocking TE, and probably a little more athletic than he’s shown in college. I think he’s overrated if anything. Terrible hands and a bad blocker. Anyone have an idea where USC’s OLB Uchenna Nwosu will be drafted? He was raising hell in the Pac 12 title game. He’s only listed at 235lbs but I could see interest from Seattle. Here is the Sheldon Richardson back to New York story. Sounds like tampering to me. I think it’s his agent doing agent things. He knows the one thing that will limit his market in the off-season is the perception he was a headache in New York. So this article, published by the #1 worst NFL writer in America, to me seems like an attempt to try and change that dynamic. At the end of the day this is Sheldon Richardson’s best opportunity in his career to get paid. So he will end up at the highest bidder, more than likely. That was my thought. Seattle could choose to franchise him and look at a sign and trade deal, if they did that with the Jets, then we are talking Kevin Costner Draft Day stuff. With Darboh, Moore, and Grayson in the wings, I don’t see Seattle taking a receiver before day 3. But maybe if there is one they like later on they would add him. Lots of people want Seattle to finally get that bigger WR for Russ. Well, why not get a “seahawky” blocking one then? OK St. WR Marcell Ateman. Why is nobody talking about this guy? 6032, 220 and nicely built. Gonna get knocked for his speed probably, but who cares. If he had elite speed, he would be going very early. It’s good enough and made up for by good route running as far as I can see. His vert doesn’t look sky high, but he knows how to use his body to box out and has the basketball background to high point the ball. He averaged 19.4 ypc this year! Put up 54/1049/8, and that’s while sharing targets with James Washington. 87.4 yards per game average. So he’s a guy that can thrive even in an offense where he is asked to make the most of few targets and block. Adversity is a check after he broke his foot in practice and missed all of the 2016 season. Added bonus that Seattle likes: he just became a father on Oct. 4. Does he get open? ‘Cause I think Russ has turned into even more of a see-it-throw-it QB than he was two years ago. I’d love a bigger WR who can win jump balls (hope it doesn’t haunt me forever that we took Delano Hill just before Kenny Golladay went), but question the value for OUR team. Maybe Chris Carson can give some inside info too on what kind of guy and teammate he is. And I think at this point, along with standing more in the pocket once he gets more used to having decent pass pro, throwing WRs open instead of waiting to see them is the absolute #1 point for RW to work on right now. The more I watch DJ Moore the more I love him. As V12 has mentioned, he’s got some Golden Tate qualities to him. He took a big jump from his Soph to Junior year. Wagner said in a presser that the two had talked things out, but Earl said in a separate interview that they hadn’t talked or made up but he’d rather just move on. It sounds slightly disconcerting, but it’s something I think isn’t really worth ruminating on by the public and hopefully will be handled privately. It’s kinda feels like it has gone from weird to weirder. Trading Earl Thomas (20% chance) – After his comments today and the ones previously mentioned in that ESPN piece this may become more and more likely. I imagine a team like the Falcons or Chargers would give up a first and change to get him. If the offer is right… who knows? If we finish 10-6 playoffs or not I doubt this will happen. But if we come out like we did against LA on Sunday… watch out. Ifedi is traded for a mid-round pick (20%) – This team moves on quickly from mistakes… this may be another one. Bevell leaves (40%) – I believe that he gets a head coaching offer to go to Chicago. Their players could mesh well with his offense. We trade back multiple times to get a 2nd and 3rd (90%) – We know this will happen. We will see what happens with the other scenarios… but I feel like we go DE/DL, RB, WR with the first three picks. I think the team only trade Earl if they are planning for an overhaul on the defense and Earl gives the vibe he doesn’t want to be a part of that, and then the right deal comes along. They can keep him for 2018, and if they don’t work out a new deal, they would end up with a pretty good comp pick loosing him, buy time for his replacement. I think the team might be higher on Ifedi than fans. I think there might be a chance after the season that they see him more as a guard than tackle. I’m starting to wonder if we see the line become Brown, Pocic, Britt, Ifedi, Fant next year. I think RW might bode better with more athleticism at RT. Yep, said that a few articles ago. Then get Fant ready for LT in 2019 when Brown is a FA. I really hope they don’t extend Brown, just let him play it out. Trade him for 3rd if so. I wouldn’t hold my breath on that. JS has stated that he would like him to retire a Hawk, and Brown has stated he would like to retire a Hawk. I think there’s a chance we see some form of an extension, especially as this team further becomes revolved around RW. Yes they’ve certainly shown the ability to easily find a good LT to replace Brown….have the last few years shown nothing?! This team needs to hold on to it’s decent/good lineman for dear life because it will take years of bad ones to find a replacement. I don’t really understand the hand-wringing over Ifedi. He has made progress this year. I have been as critical of the Hawks OL as anyone but I don’t see Ifedi as the issue. Sure there have been penalty issues and lapses in composure but for his 1st year at RT in the NFL I think he has been decent and has the potential to be a solid starter longer term. IMO the issue has been our Guard play in the run game and against elite interior pass rushers they have just not held up. Both Joeckel and Pocic have been over powered and dominated at times by DTs. This is kinda why, in my armchair way, would love to see Ifedi back at guard. I think he stands a chance at being a better player at the position, maybe even an elite player there, and that could go a long way for the offense. Watching this offense through most of this year in comparison to the previous two years, I’ve started to wonder if what they might have missed was the athleticism at RT that Gilliam provided and how that benefited RW at times during the course of each game. I’ve begun envisioning Fant at RT, with Ifedi back at RG, and Pocic at LG, or possibly Ifedi at LG where he would play along side his idol in Duane Brown. I still believe there is a really good player in Ifedi, but wonder if there is going to be a bit of. Justin Britt road of him finally settling and uncorking things. The guard had a bad day vs the Rams but most teams do vs Aaron Donald plus LA played in attack mode all day because the game quickly ran out of control. Enough of this trading down and still getting ONE of the players we want. I want to get THE player we want. We need a running game and I think it’s more the running back than the line. Single out the RB we want and fits the most and go and get him. I think Sundays game (with a small part final game) could really decide what the Hawks do next year. Hawks win and win again in week 17. They go 10-6, end on a high note and look to retool with emphasis on getting a RB and making some cap space moves. Hawks lose Sunday (and possibly not care what happens week 17 and go 9-7 or 8-8. Losing 3 or 4 of the final 4 games, the Hawks look for major overhaul and cutting/trading of expensive veterans and don’t look to resign anyone. Also, at least 1 coach (DB or TC) leaves. I’m hoping for Scenario 1, but my gut tells me it is going to be a difficult task to go into Dallas and bounce back against a team that wants to put the same hurt on them that the Rams did to keep their playoff chances alive. Seattle will have to be on fire, and today’s press conferences all felt a bit somber. I think Scenario 2 is probably more likely, at this point, sadly, but with them ending the season on a bit of a higher note beating the division rival Cardinals, and ending the season with a 9-7 winning record that won’t feel totally like a winning record to many. Who knows, though. I had little expectation they would be the Eagles, then after that, I was sure they would take one of the next two games which they didn’t. I might be very wrong but I don’t anticipate coordinator firings. I think they will add to the staff. I also think they’ll be thinking about major surgery to the roster whatever happens. This isn’t a team, HC or GM that is willing to coast. And I think they believed they could win with this group if they stayed healthy and this year proved they can’t rely on that any more. I can understand it though — a year ago without a healthy Russell Wilson for the whole season they could/should’ve had the #2 seed in the NFC. But now they know changes are needed. JS please sign josh gordon with jimmys cash. What is Mcdougald natural position? Is he beter as FS or SS, and what did he play in his last season at TB? What is yours opinion for him as a long term replacement for ET? He was the starting FS for the Bucs last year. He might suffice as Earl’s replacement for a while. I think Seattle covets elite speed at the spot, he might be more of a bridge for the next guy. Ah, that makes a lot of sense. Go Hawks! I agree I think he can play either spot and could fill in for Earl at a high level if needed. I think Pete genuinely really likes him as a player, as well. If the unimaginable did happen, and they dealt ET III, I can see them going with him at FS. Has anyone watched Western Michigan db Darius Phillips? I’d be curious to hear opinions of Bo Scarbrough of Alabama. Slightly surprising to me that his name hasn’t popped up in these discussions of RBs. Big strong cat. Lot of wear on those tires. Moves pretty fast for a big back. I don’t know how durable he would be at the next level, or how shifty he would be. Part of me thinks Scarborough could be a weapon at H back or FB? Kinda see the same thing in AZ St’s Ballage. Interesting potential, but are they feature players? You know how Le´veon Bell is always praised for his patience in the run game? Rawls is the complete oppisite. To me, he always seems to just attempt to find a whole and just jump into that, falling on his face real quick, same with Lacy. I like James Washington – Not featured here. Thoughts? No, it’s not all doom and gloom – but the Rams result has been coming and it has been since last season. Perspective – it’s not like we are getting blown out week in week out, or when we do lose being beaten by more than 10. We have been so excellent over the last few years that ‘normal’ is (rightly) considered failure. But the drip of below par form has turned into a trickle. We need it to stop before it becomes a flood. We showed we still got it in the win v Eagles though. However, there is still talent in the D. But for me, there HAS to be better pressure on the QB. Letting Bortles look like Tom Brady was unacceptable. I understand that the edger rushers priority in the Seattle D is set the edge and contain…..but look as the Jags – constant pressure and a ton of sacks and interceptions. What are they doing we aren’t? Is it simply they have better players on the D line? Maybe. Or is it a coaching issue? The word stagnant has been used on here to describe the Seattle D of late – I agree. How can we freshen it up, make it more impactful, give it more energy? Is our recent drafting strategy been poor? Have kept certain players to long? Is it an overall scheme issue? I don’t think it is one particular matter, but a number of matters that need to be addressed. The D getting old has been mentioned too……….I don’t think it is, but what I will say is that the core players over the last few years have totally excelled and I don’t think it is wrong to say they were always going to start to burn out earlier in their careers than normal. To underline my opening comments, this D has without question been one of the elite D’s in history, and has played at that level for considerable time. Any drop off would be noticeble and magnified, and normal is seen as failure. That is the bar this organisation has set. There are good enough younger players on the roster on the D, and Wagner/Thomas/Wright an be the core for another 2-3 years. Offense wise – I believe we were a Chris Carson away from fully nailing it this season. I really believe the line will be ok – not good, but ok – next year. Russ will still be Russ, but if (I know – we siad the same about Rawls) Carson is still good, and Davies keeps getting carries, the running game will pan out just fine. For me, I think letting Graham go and using the TE’s to reinforce the run game should be priority (Willson is a good TE, not elite, has good hands and can block. Vannett has shown signs of life too). McKissic and Prosise (if fit) can provide addtional targets to Graham. Yes JG has been good in the end zone this season- but of late not so good out of it. I hope we keep P-Rich. Baldwin, Lockett, P-Rich and Darboh will be a good 1-4. Interesting to see if McEvoy is kept around, but he has had a poor season. At the end of the day, we still aren’t a losing organisation, could still end up with a winning record, and have a slim chance of making the play-offs. For some organisations that is considered respectable – but as mentioned, the Seahawks bar is set high. Here’s to 2-0 for the rest of the regular season. The more I think about the 2018-19 Season I think it will likely be more of a transition year than a complete rebuild as Mike Silver Suggests. Avril and Lane – Almost certainly cut or Avril retires. This is almost $13 mil in cap space freed up with very little dead $. Sherm- Has no trade value coming off an Achilles tear. I assume he will be back and likely play well. If he comes back healthy I could see the Hawks extending him or he leaves next off season and we get a 3rd round comp. Bennett- I don’t think he has any trade value with his decline in production, off field views and age. I don’t think the Hawks cut him as there is not much cap relief. So he is likely back and that is a good thing IMO. He has played with a foot injury this year and if he comes back healthy could be a perfect situational pass rusher inside or out and a solid leader to mentor the young guys. Earl- The more I think and hear the more I think that Earl is the most likely to be traded. He seems unhappy, will want a big $ extension and is an undersized 29 year old Safety that relies on speed. Extending him with a big contract would be a huge mistake IMO. How has it worked out for the Chiefs with Eric Berry or the Hawks with Kam. Safety is a physically demanding position with some of the most violent collisions. If Earl was not so reliant on speed I would not be worried but all players slow down as they age. I think JS puts Earl on the market and gets a late 1st rounder from a team like the Jags. Mcdowell- He really is the key to the whole off season. If he can come back in 2018 and be the player the Hawks thought they were drafting then the DL looks a whole lot different with a young core of Clark, Jones, Reed and Mcdowell to build around. If he does not then DL is a major area of need IMO. Richardson – Sounds like he is already positioning to test the market and get a max $ deal. Can’t blame him. I just don’t see the value for $15 mil + APY. I hope they let him walk and pick up the 3rd round comp. If Mcdowell does not come back then they may have to look at Richardson. Mcdougald- Priority re-sign IMO. He can play either Safety spot and has played solid all season. I see Mcdougald at FS and Kam at SS in 2018-19 with Hill and Thompson as backups. With Free Safety as an area for JS to focus on in this year or next years draft. Clark- If the Hawks are going to spend $ on the DL this off season I hope it is to extend Clark as he is an elite pass rusher who should only get better and a corner stone piece. Desahwn Shead- I am thinking he will almost certainly sign at a Vet Min deal and come back to compete for a spot. Deandre Elliott- Forgotten guy but I think the Hawks had high hopes for him. It will be interesting to see how he bounces back. Justin Coleman- Must resign! The best slot corner in the PD era IMO. -Kenny Vaccaro (FS)- Not sure what is market would be. He has underachieved in NO but I loved him coming out. I trust Pete when evaluating secondary guys. -Shariff Floyd (DT)- at 25 he would be a nice young DT to add to our rotation. Good thoughts as well Trevor. So many different directions you could go. McDowell is a huge deal, it can make DL important for draft or not. I wouldn’t want to bring in any high priced defensive FA. Young and cheap( hungry) to me is most important. I initially had a very similar take to this. However, the thing about Silver, as I am finding out, is that he is pretty tight with John Schnieder, and apparently spent the weekend in Seattle hanging out with Schnieder. Interesting that this story came out right afterwards. Even more interesting if we look at the track record with just how leaky this organization can be. Leaks happen for a reason. Could be leaks to brace the fan base for what is to come, or could be leaks to remind players that no job is safe, and decide right now if you want to still be a part of this team moving forward. I kinda sense this could be a leak to brace the fans. Agree on McDowell. 100% they drafted him with an eye toward other DL like Bennett and Avril with their age and contracts. It’s unfortunate that he’s such a huge unknown at this point. Even if he plays, it will be his “true” rookie season. Probably along the lines of the Bruce Irvin situational 8 sack type rookie season would probably be the ceiling we could expect in terms of impact (not pure counting numbers, just the effect on the overall D). my thoughts on what the hawks do this off season. Not what I want, etc, but based on how they operate. And I am in no way saying I can do it better, I have faith in them and realize how hard their job is. I live near Buffalo and they are ecstatic the Bills are 8-6. I have followed the Hawks since 1977, things could be and have been worse for 12’s. QB- As is, maybe bring in a UDFA to compete with Davis and Boykin. They need a better back up, but don’t have the draft capital this year to do anything. RB- I think they bring back Carson, Procise and McKissic. Draft a RB, but not their top pick. Probably bring in a vet, but on minimal contract. Procise may switch to WR. FB- probably use late pick and some UDFA. TE. I think G is gone, unless he takes short term deal for $6-7 mil/year. I think someone else gives him more, and I think he does not block well enough and disappears too much. Lacks grit. Probably bring back Willson, but need Vannett to step up, curious about Swoopes. OL. I think Joeckel is gone. Does not have enough power and will want too much money. I think Ifedi improves and for those who hate him, remember what Gilliam and Britt were at RT? I think Pocic takes RG and gains some weight & power, and they will let Roos, Rees and Fant fight for LG. Maybe draft OL late, pick up a couple of cheap vets for back up, competition. I think bring back 4 of 5 lineman will help improve things. DL. I thin Avril is gone, Bennett is back, for at least 1 more year. Play injured, and they need some vets. I think Sheldon may stay if the price is right, it also depends on if they think Malik can play next year. Malik is the wild card, if he can play, they will have some good, young talent. I think they draft an edge/LEO with first 3 picks. If Sheldon goes, they find a cheap, vet DT who can stop the run. LB. I think they draft a LB with first 4 pics, might take another one later. Need a SAM and young back ups. DB. I think they take another corner with first 4 pics. McDougall may stay if price is under $3 mil/yr, but they drafted Hill to play and I suspect he becomes main back up to Kam, or starts if Kam is out. I doubt they trade Sherman. They won’t get anything for him and he is needed until some kids prove they can play at a high level. Probably take another db later in the draft also. PK, and P. Probably replace both, need new blood, new legs, better kicking game in every respect. I doubt they keep their first pick. They will try to get a second and 2 3rds out of their top pic to recover some depth. I doubt they pay any big free agents, as they will want the comp pics for 2019 draft. I think they go for a lot of UDFA to make up for lack of draft capital and try to rebuild some the fiery youth that seems to be missing. I really think they try to win next year, but will accept an off year if they can see it all come together in 2019. I also think they make some moves to free up cap space for 2019 and make sure they are not so tight in 2018 as they were this year. Hindsight is always 20/20, but with the LB crew, I don’t know anything about this years crop of LB’s other than Roquan Smith, but it seems like last year was a great crop of LB’s and Rob did a fantastic job writing them up. Imagine if this team had Reuben Foster or Zach Cunningham on the bench when Bobby or KJ got hurt as well as going in to the future. There appears to be some good ones. Jefferson, Smith, Evans, Edmunds, Armstrong. Good write up Hawk eye. I like your thoughts. Nice writeup agree with almost everything! Last LB Seattle drafted was KPL, right? Really need some talent there. Last year, Rob kept writing how Reddick would be a perfect pick, did we pick up anything at all similar? So without further ado I’ve started down the path of safeties and more specifically players that might, might be the heir to ET3. This is not comprehensive and if anyone knows how hard it is to find game tape featuring DB’s, you’ll know that more often than not they are literally out of the frame for most plays as that football officially films the action of the ball. So the things I personally look for is, angles on tackles, how slow do they react to plays….do they let other players clean things up and pile on? A lot of teams in college use safeties as blitzers and depending on the team it can be play after play, so I look for how fast does the player react when it’s Run/Pass/Option that changes to run. Does the player just keep running, hair on fire, or do they change course, sift through the traffic and become an asset in stopping the run. Here goes currently I have three late rounders that I’m interested in seeing two of at the Senior Bowl. And one has two more games in the CFB playoff. The Senior Bowl invites start with Trayvon Henderson out of Hawaii. Game footage of Hawaii often looks like it’s a high school game. But in the small bits I’ve seen of him, he flies, flies off the edge on blitzes, hits hard but in an extremely smart way wherein he just drills players straight on taking no unnecessary risk. I’m particularly interested to see if he bubbles up on any scouting reports during Senior bowl week since Hawaii plays nobody, as a rule, it’s hard to gauge where he’s at. Currently, I think he’s a UDFA but could be great for special teams a position that has strangely become a real need in Seattle. The second player is Quinn Blanding. out of Virginia. Listed as 6’2 209 is clearly going to pass the Seahawks Length requirements. He’s lanky to me but very fluid. Sort of a mix of an in the box safety and a FS. It seems to me he can’t cover ground as quickly as Earl, but in a few games, I’ve seen he gets into the play with ease. Great tackler compared to most of the safeties. Is not a “lay the wood,” type but uses his long arms to wrap up and drag down. Feels oddly slow in diagnosing run plays but again in the few tapes I’ve watched is right there stopping the run. And can stone RB’s in their tracks. I’d consider him as high as a 3rd depending on a teams needs but he’ll more than likely go in the 4-5th. And the guy I have my eye on the most during draft season. Van Smith. Had a monster year for Clemson in 2016 but got injured early last season. Listed as 5’11 195lb he’s rangy, can cover a lot of ground, good when the ball is in the air. Sort of a middle ground of laying the wood with the shoulder strikes and a good tackler. Rarely stands around watching plays develop. I’m not going to go out and make silly proclamations but of the safeties I’ve watched if you’re looking to think about an Earl Thomas replacement, I think Van Smith would be the first player I’d look to. One final thing. After looking at Safeties for a few years I’ve noticed that a common theme in how safeties at least pre-combine are ranked is “big hits.” I think the big hit phenomenon is based on how little film there is to watch. Per example, I’m currently seeing a bit more hype for Armani Watts (Texas A&m) and Godwin Igwebuike (Penn State). Godwin to me I have not looked at much but what little I’ve seen he’s just a classic safety looking to lay the wood. And Armani Watts is all splash plays. Bad angles, coiling up into a spring before hits, looking to strip the ball away ( good thing for sure, but sometimes you need to just tackle.) A great example is his tape against Tennesee 2016. In one huge play, he does cause a fumble off of Kamara after Kamara rips off a huge run. Which is awesome. But then for almost the entirety of the game he’s late, he’s one-armed tackling guys, he’s going low with his shoulder against Kamara who easily beats the tackle attempt time after time. Interesting post I will have to check out those guys for sure. The kid from Clemson sounds like someone to monitor. Any idea what range he is projected to go? van smith had a down year so I’m currently seeing rounds 3-5. Any reason for down year like injury? Sorry just saw your note about injury early in year. Age collapse comes quicker than most think. Ask the 49ers. Good thing is great coaching brings young players up quicker than most think. Ask the Seahawks. Some non Seahawk Free Agents to consider that are 27 yrs old or younger. Would love to hear what people think about them as a fit for Hawks. Anzah is a guy that is intriguing to me. Has had a couple so-so seasons after a 14 sack season including injury. If the market is lukewarm the Hawks might be able to “Bennett” him. Offer him a one year deal for $9-12m and sell him on re-establishing value for another major crack at FA the following year. That would be the ideal scenario though. I was thinking the same thing. Just how we nabbed Avril from them. Would be funny if Lions provided us our last two pure Edge rushers. Young and fast on defense and experienced on offense for me. I wouldnt mind Pugh, Sua Filo or Fluker to play LG if they move on from Joeckel. I also like yound for an RB as well so no to Hyde even though I love the guy. You keep talking about Pryor, maybe Darboh can be the 50/50 high point gy next year. He has made nice catches like that at Michigan. so maybe he fits right in…. – Trade Earl to Jags for a 1st round pick and use that pick to trade back and pick up a 2nd and 3rd. Can you tell I am off work and have too much time on my hands this week. That is some future tripping if I’ve ever seen it my man. Instead of signing those 3 FAs? Just go get DeMarcus Lawrence. I guess if you dont sign Richardson, Graham or Joeckel you could actually make a run at Lawerence. Usually JS sets himself up well for what the needs of the team will be in relation to what positions of strength will be available come draft time. Other than RB though, this year feels like he maybe missed the mark? Or just didn’t forsee some positions not being strong for lack of a term? You write these all the time Trevor and I love them. I think about this it seems to much. Damn I woke up in the middle of the night wondering which of the 5 main Free agents will stay/go. Its called an obsession and you know what. Its alright. Who fills the Sheldon sized hole at 3Tech? Draft Pick? Anyone else think Zeke Elliott is gonna run all over this team? This stretch of schedule had 3 of the 4 best RBs in football (Le’Veon Bell would be the 4th) and Seattle did nothing to slow down Fournette and Gurley. It could go either way. The Hawks could step up and shut down a rusty RB or they could hang there heads and a fresh RB could go crazy. I’ve seen nothing from these past 2 games against elite backs that leads me to beleive they’ll have anything but troubles with him. Matter of fact, they haven’t shut down one good- great RB this entire year. They did Gurley week 5. A good rushing attack against the Eagles. Maybe your right and Zeke goes ballistic. Maybe Im just wishful thinking. Definitely think it has the potential of that. Part of me also thinks the defense sets out for some redemption with Wags being a it healthier and KJ back. With the whole season being so nutzoid, hard to pick it. Seattle’s defense certainly feels on the ropes. Man I remember back in August when I did my 53 man prediction and I said for me it would come down to Alex Collins or Chris Carson at RB. Couple dudes on here reacted as if it was the most asinine thing they’ve ever heard. Imagine that. Sure, some of his success could be contributed to a better O-line in Baltimore, but if Seattle’s O-line ain’t as bad as some of ya’ll beleive, then they made a mistake, no? They also messed up by leaving Mike Davis on the PS for how long? Pete actually admitted as much himself. I just watched Sam Gold’s analysis on Field Gulls. My conclusion? Our O line is as bad as we thought. Maybe worse. Coaching or talent? If it were up to me we’d go straight power blocking. Simplify the scheme and open some @#$%^& holes! In my opinion it’s worse and it’s coaching. You can not have a line this bad for this long and it not be on the coaches. Pathetic. I might like Ifedi at LG. Fits his body type and he could be in between Brown and Britt. he does have the profile they like at LG. but here is the big question. Do you play him at LG, 3rd position in 3 years and put Fant at RT, both on their “opposite sides” and think it will be better? I wouldnt mind the 3 positions in 3 years as it turned out OK for Britt. Then put Fant at RT. I just then worry about having a back up tackle. If Ifedi stays at RT then Fant can be a swing. If Ifedi went to LG and Fant went to RT then Odhiambo is our back up. Hard to say. I guess I dont see Fant as a guard. Definitely agree about hte KJ comp. been scouting him the last few days and he is the star of that defense. Doesn’t really have a hole in his game and will probably be available sometime in the 4th. This years group of linebackers pre-combine look a lot better than lasts years. Pauline thinks he can slide into late one now. Yeah he is. Slick player. Love both Vander Esch and Wilson from BSU. Seahawks fined $100k for Russell Wilson concussion issue. When did he have a concussion? game he went in and out of the tent in 20 seconds. True or False? It’s opinion based, but just go with it. Sheldon Richardson for Kesrse and a day 2 pick was a good trade. At the time I thought TRUE, in hindsight I think meh, probably false especially if he’s not in the future plans. Yeah I felt the same way both of ya’ll did at the time. Can never predict the future, but I wonder why more teams weren’t jumping the gunto get this guy and now we may know why. As it stands now, bad trade. If the team hadn’t had gotten so injury riddled on the defense, could have been really good trade. I liked the aggressive move. I would rather have my second so I go false. I liked it at the time though. If we dont trade we probably keep Rubin. bad trade because of all the injured players. could have been good if health was better. also depends if they resign him, and for how much, or if they get a 3rd rd comp for him. Can’t count on 3rd round though, couple other higher profile free agents, and I doubt anyone pays him $15 mil a year. He has talent, but he has issues and only 1 sack this year. Close does not count. Chancellor, Thomas, Wagner, Wright, Bennett or Avril looked before they signed their big deals. Look at this draft class for N.O. Thats killing it. Instant production and a serious reason they could represent the NFC in the Super Bowl. Yeah, they’ve put together a fantastic roster. Really like their receiving core of Michael Thomas, Brandon Coleman, and Willie Snead. Maybe the sky already fell but we’re in denial. They’re very wrapped up in ‘cool kids.’ Or selecting a guy because he’s had a rough upbringing and they wanna help. Which is all well and good, but is that gonna translate to the field other than you know they won’t quit? ‘We knew he’d fit because he played the saxophone in HS’ or some sh** like that. However, their scouts do a phenomenal job of finding the under appreciated/over looked prospects. But again, the point of the article is undisputable; no draft picks to make the pro Bowl since R. Wilson. I truly detest articles like this. Oops. Add Okung, Baldwin, Leon Washington and Michael Robinson to that list of Pro Bowlers. Good grief. No guys, the author is talking about DRAFTED players. I get all of the subjective variables, but I don’t think it should be just dismissed either. Otherwise how do you explain the first couple of years’ success compared to the last several. And its not just draft position. There has been an enormous amount of draft capitol traded with arguably questionable return. Well first of all, the draft isn’t the only way to acquire good players. While technically accurate the article does not address that point in any way. The Seahawks have arguably been one of the best teams at finding talent in unconventional places. Secondly, Britt, Clark, Lockett, Carson, Naz and Griffin all have bright futures. Pro Bowl or not there’s a good stable of talent acquired recently. For sure the hawks can always add talent and sure they need to more closely replicate their early draft success, but I really don’t think the conclusion the article points to is as dire as all that. I’m finding it rough to compare Harris to he Georgia backs, when Harris is playing someone with an actual defense, and they faces Choke-lahoma. There wasn’t much defense in that game. Harris looks like he’s got some wiggle and is making the most of his touches. I think I may have fallen in love with Chubb and Michel today and I know how lame that defense was today.